The meaning of any text can be greatly clarified if the fundamental purposes or goals of its primary author are known. The Book of Mormon is no different. Those readers who want to deepen their understanding of its message would do well to pay attention to Mormon’s selection of source material, his frequent editorial comments, and his own explicit statements about why he was writing his record.1 Mormon sprinkled clues about his purposes and source selection throughout the Book of Mormon that can be easy to miss. Gathering together these clues, a number of things can be learned about Mormon’s primary goals and purposes. Mormon declared that he was creating his record so “that the prayers of those who have gone hence, who were the holy ones, should be fulfilled according to their faith” (3 Nephi 5:14). Mormon likely had past prophets like Enos in mind here (Enos 1:13–18). In this sense, Mormon’s purpose was to fulfill prophecy “according to the will of God” (3 Nephi 5:14). After analyzing Mormon’s primary sources, John L. Sorenson asserted that one of Mormon’s major editorial aims was to affirm Lehi’s blessing upon the land: “Inasmuch as ye will keep my commandments ye shall prosper in the land” (Jarom 1:9).2 Sorenson further noted that “overwhelmingly, Mormon’s writings depict the Nephites poised on the edge of destruction due to their failure to meet the condition of Lehi’s law of survival.”3 Such narrative episodes aptly serve as a warning to modern audiences who are similarly threatened by impending calamities (see Doctrine and Covenants 1:17). Richard Holzapfel has argued that “Mormon’s motive for writing and editing the Nephite record seems clear. 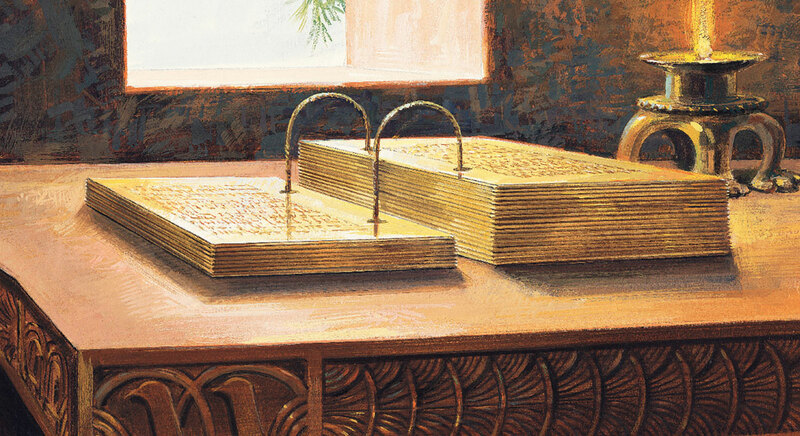 He regularly sought to draw spiritual lessons from the course of Nephite history.”4 Also, the Book of Mormon provides spiritual guidance as it works as a companion with the Bible, “unto the confounding of false doctrines and laying down of contentions, and establishing peace” (2 Nephi 3:12, cf. Mormon 7:9). In Words of Mormon, readers learn that Mormon was writing for a “wise purpose; for thus it whispereth me, according to the workings of the Spirit of the Lord which is in me” (Words of Mormon 1:7). Interestingly, Mormon then stated, “I do not know all things; but the Lord knoweth all things which are to come; wherefore, he worketh in me to do according to his will” (v. 7). This suggests that, at least on some levels, even Mormon didn’t understand the full purpose of his record. In many cases, he was likely selecting sources and making comments according to the “workings of the Spirit” and not necessarily his own thinking (v. 7). These various examples help demonstrate that Mormon’s editorial goals were sometimes layered and complex—and likely developed and changed over time as he worked. Grant Hardy recognized that “as a historian, [Mormon] needs to present an overview of Nephite history that is true to his sources; as a writer, he wants to construct a narrative that is aesthetically pleasing and compelling; and as a moralist, he takes responsibility for teaching correct doctrine and providing spiritual guidance.”7 To this it can be added that, as a prophet, he sought to accurately portray the mind and will of the Lord. Yet whether writing as a prophet, historian, literary artist, or moralist, Mormon’s overarching purpose was clearly intent on helping future generations “believe in Christ” (Mormon 7:10). Mormon seemed to understand that the fulfillment of his various narrative goals and the overall persuasiveness of his record was strongly tied its status as authentic history.8 Hardy explained, “Generally Mormon is a practitioner of narrative theology; that is, he relies on stories to convince readers of the power of God, the consequences of sin, the reality of prophecy, and so forth.”9 Yet for these stories to have their full persuasive effect, they must necessarily be true. It can thus be seen that Mormon’s various purposes could only be accomplished if the Book of Mormon were accepted as the legitimate historical document that it is. Its stories of faith, repentance, sacrifice, service, miracles—and especially its account of Jesus Christ’s resurrected ministry—are so powerful because they are historically, and not just metaphorically or symbolically, true. Mormon’s “urge for historical accuracy,” however, shouldn’t lead readers to conclude that the portrayal of history itself is what will do the convincing.12 Rather his recorded stories and inspired commentary serve as vehicles for personal revelation. Moroni’s famous promise, for instance, explicitly exhorts and invites readers to ask God the Eternal Father about the truthfulness of the record, and ensures that if they do so in sincerity and faith in the name of Jesus Christ, “he will manifest the truth of it … by the power of the Holy Ghost” (Moroni 10:4). Because the power of the Holy Ghost will unequivocally testify to the historical reality and spiritual message of the Book of Mormon, it therefore stands as a valid witness of God’s influence and interaction with His children.13 To believe in the truth of its stories is to believe in the divinity, resurrection, and miraculous power of Jesus Christ. To follow its messages and commandments is to follow the words, inspiration, and “Spirit of Christ” (Moroni 7:16) and to “come unto him, and be perfected in him” (Moroni 10:32). Grant Hardy, Understanding the Book of Mormon: A Reader’s Guide (New York, NY: Oxford University Press, 2010), 89–120. Brant A. Gardner, “Mormon’s Editorial Method and Meta-Message,” FARMS Review 21, no. 1 (2009): 83–105. Richard Neitzel Holzapfel, “Mormon, the Man and the Message,” in The Book of Mormon: Fourth Nephi, From Zion to Destruction, ed. Monte S. Nyman and Charles D. Tate Jr. (Provo, UT: Religious Studies Center, Brigham Young University, 1995), 117–131. 1. Concerning Mormon’s interjected commentaries, Grant Hardy found that there “are more than a hundred such interruptions, distributed evenly throughout Mormon’s history.” Grant Hardy, Understanding the Book of Mormon: A Reader’s Guide (New York, NY: Oxford University Press, 2010), 97. He categorized them as follows: (1) comments dealing with the editorial process, (2) summaries, (3) explanatory details, (4) notices of fulfilled prophecies, (5) narrative foreshadowing, (6) intensifying exclamations, and (7) moral generalizations (pp. 97–98). 2. John L. Sorenson, “Mormon’s Sources,” Journal of the Book of Mormon and Other Restoration Scripture 20, no. 2 (2011): 12. 3. Sorenson, “Mormon’s Sources,” 12. 4. Richard Neitzel Holzapfel, “Mormon, the Man and the Message,” in The Book of Mormon: Fourth Nephi, From Zion to Destruction, ed. Monte S. Nyman and Charles D. Tate Jr. (Provo, UT: Religious Studies Center, Brigham Young University, 1995), 119. Importantly, Nephi—whose writings make up a large portion of the Book of Mormon—seemed to share Mormon’s approach of drawing out spiritual lessons and insights from real narratives. Roy A. Prete explained, “As might be expected, Nephi does not follow the practice of modern scholars of differentiating between the historical, doctrinal, and philosophical components of his interpretation, but presents an approach that integrates past events and his own experience with prophetic insight and understanding.” See Roy A. Prete, “God in History? Nephi’s Answer,” Journal of Book of Mormon Studies 14, no. 2 (2005): 29. 5. For information about the authorship and composition of the title page, see Clyde J. Williams, “More Light on Who Wrote the Title Page,” Journal of Book of Mormon Studies 10, no. 2 (2001): 28–29, 70; Sidney B. Sperry, “Moroni the Lonely: The Story of the Writing of the Title Page to the Book of Mormon,” Journal of Book of Mormon Studies 4, no. 1 (1995): 255–259; David B. Honey, “The Secular as Sacred: The Historiography of the Title Page,” Journal of Book of Mormon Studies 3, no. 1 (1994): 94–103; Daniel H. Ludlow, “The Title Page,” in The Book of Mormon: First Nephi, The Doctrinal Foundation, ed. Monte S. Nyman and Charles D. Tate Jr. (Provo, UT: Religious Studies Center, Brigham Young University, 1988), 19–34. 6. Brant A. Gardner, “Mormon’s Editorial Method and Meta-Message,” FARMS Review 21, no. 1 (2009): 98–99. 7. Hardy, Understanding the Book of Mormon, 102. 8. See Book of Mormon Central, “Why Did Mormon Introduce Himself in 3 Nephi 5? (3 Nephi 5:12),” KnoWhy, 194 (September 23, 2016). 9. Hardy, Understanding the Book of Mormon, 119. 10. Stephen O. Smoot, “The Imperative for a Historical Book of Mormon,” at The Interpreter Foundation (blog), October 20, 2013 (accessed October 16, 2016), online at mormoninterpreter.com. 11. Eugene England has argued that although “the religious and moral content of the Book of Mormon is indeed what matters most—is the only part that is ‘life-changing’—still, I am convinced, through my own professional expertise as a teacher of both fiction and ‘true’ personal essays, that it matters very much to readers whether they believe that what they are reading is conveying moral and spiritual truth through made-up stories about things that could happen or on the other hand bearing witness fairly accurately of what actually happened to people like themselves.” See Eugene England, “Orson Scott Card: The Book of Mormon as History and Science Fiction,” Review of Books on the Book of Mormon 6, no. 2 (1994): 62–63. 12. Hardy, Understanding the Book of Mormon, 116. Critics of the text may question its plausibility or historicity on intellectual grounds, but the Book of Mormon was never meant to be proven through scientific or historical analysis. Elder Dallin H. Oaks has taught, “In fact, it is our position that secular evidence can neither prove nor disprove the authenticity of the Book of Mormon. Its authenticity depends, as it says, on a witness of the Holy Spirit.” See Dallin H. Oaks, “Worthy of Another Look: The Historicity of the Book of Mormon,” Journal of the Book of Mormon and Other Restoration Scripture 21, no. 1 (2012): 68; originally published in Historicity and the Latter-day Saint Scriptures, ed. Paul Y. Hoskisson (Provo, UT: Religious Studies Center, Brigham Young University, 2001), 237–248. 13. Concerning its status as a second witness, President Ezra Taft Benson taught, “The Book of Mormon is not on trial—the people of the world, including the members of the Church, are on trial as to what they will do with this second witness for Christ.” See Ezra Taft Benson, “A New Witness for Christ,” Ensign, November 1984, online at lds.org.